These twelve modules are based on the approach and principles of Body-Mind Centering® and my practice as a movement researcher and educator. As the primary mode of learning is through embodiment, participants will need to spend time studying the different systems and developing a personal and collegial movement practice. 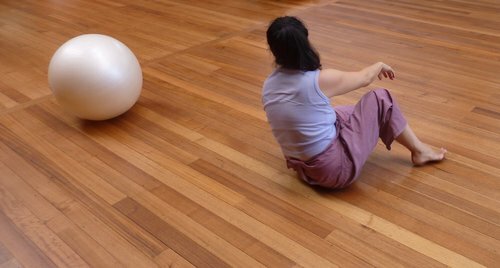 The modules include somatizations (guided movement); experiential anatomy (structures, systems and tissue); images & objects; videos; touch & repatterning; and integration (moving, writing, drawing, walking, dreaming and/or conversation). Studies are supported through private sessions and supervised practice. Embodying bones offers an experience of our inner structure and architecture. We discover the skeletal system’s capacity to stabilize and mobilize. How as a basic framework it gives form and structure to our body; contains our organs; offers qualities of clarity and effortlessness; provides stability, leverage and mobility through space; and supports our articulation of form in space. Through anatomical and somatic exploration we discover both the specificity of our articulating bones and their global organization in locomotion through space. Organs are the contents of our musculo-skeletal container, providing us with a sense of volume and weight. They are about process, fullness and emotional expression. They provide multi-dimensional support for our movement, breath and voice. Organ tone underlies alignment, presence and our sense of vitality. From the recognition that, the moving body is perceiving, we begin to realize an embodied kinaesthetic knowing through our organs of perception and their relationship to the planes of existence, gravity and space. Through the specificity of our sense organs we feel and sense the role they contribute to our expression of self and engagement with others. This study recognises perception as a psychophysical process and perceiving as the process of how we receive and respond to new information. This includes the bonding and defending response in every act of perceiving and its influence on learning. · Identifying the six sense organs of the body and understand their basic functions – movement, touch, taste, smell, hearing and vision. · Developing an understanding of the process of perception through awareness of how we receive and respond to new information. We are essentially a fluid dynamic body, changing from breath to breath and moment to moment. Fluids support our feeling life and our capacity for empathic response. Our fluids transport essential elements around the body through our blood, lymph, and cerebro-spinal fluid. Fat provides warmth and protection, whilst fascia creates a network of tensegrity support through the body. · Fluid membrane balance through an understanding of the fluid mosaic model of cellular respiration. The nervous system is a communication system that underlies thinking, movement precision, perception, creativity and imagination. The nervous records experience for later recall, reflection and repatterning. Different branches of the nervous system support a balance of action and rest, and contribute to our capacity for a variation of response depending on content and context. Embodying the brain and spinal cord as organ tissue allows emotional expression. In this course we will also address recent research regarding the role of the vagus nerve and trauma. As we gain insight into our personal style we learn to recognize and reflect on our responses to differing stimuli, widening the field of our awareness and through this our capacity for relationship. Together with our bones, our skeletal muscles create the protective container for our more vulnerable organs and soft tissue. They provide the flesh covered boundary for our bodies. Muscles contribute generously to the expression of who we are, offering comfort and ease to our moving lives. Muscles move us through space and enable us to develop specific kinesthetic skills. 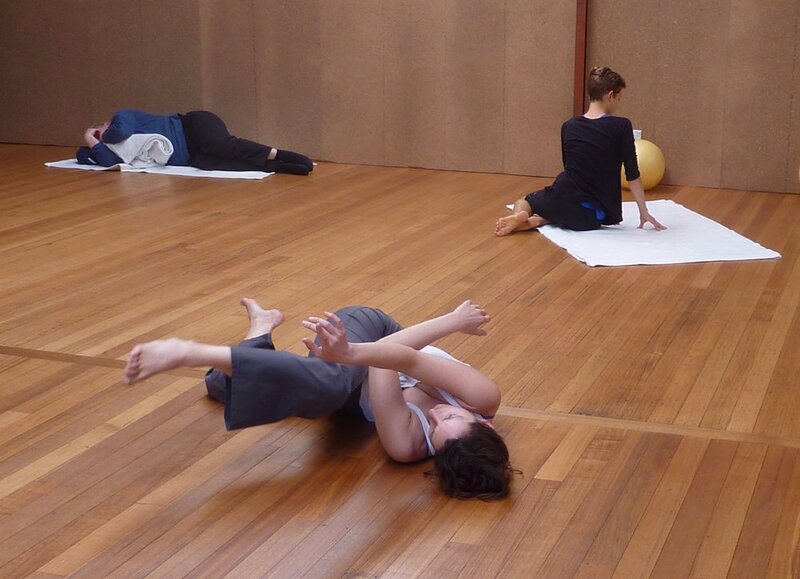 Embodying muscles allows us to feel resistance and boundaries and to navigate release and resolution. Maintaining flexibility and mobility throughout our lives requires that we engage our muscles with intelligence and sensitivity. A balanced approach creates an enduring capacity for pleasure in moving. This course will include elements of the ligament system. Embodying the ligamentous system helps us find specificity in movement, refines articulation and clarifies our focus. The endocrine system is closely aligned with the nervous system and is the first system to mature in our development. This underlies its critical role in our survival through relationship and attachment. It is the system that connects us at a personal level through the expression of our sexuality. It is also the system that connects us to a more impersonal universal state of awareness. A highly selective communication system – the endocrine glands rely on the fluids to transport the desired chemicals to specific cells – it is the system underlying the paradox of our existence - spirituality, play and spontanaeity. As a field of energy it constellates the attraction and magnetism of relational life – the sensual Eros of love. We manifest our state of being through our breath and we communicate with the world through the expressive qualities of our voice. Our voice reflects the functioning of our whole body and being. · Bring kinaesthetic and auditory consciousness to our vocal structures. This is the study of human development during the first eight weeks following conception/fertilization. Conception involves the joining of the ovum of the mother and the sperm of the father – two diverse cells create a unique individual. From embryonic breathing to the embodiment of all our tissues – we sense and feel our way towards the embryological consciousness that is still present in us. We sense our potential ... new life pauses on the threshold of becoming. · Development as a series of folding, migrating, expanding and continuously becoming. Embodying the developmental movement patterns brings all our movement history into the present moment. During the course of these two modules you will be guided through the different stages of human evolution from pre-vertebral to vertebral, from pre-birth to locomotion. We will embody these patterns and learn how they establish the foundation for attachment, language and communication. The integration of these patterns brings fluidity, openness, power and clarity to all of our actions. When we add an understanding of our bones, organs, fluids and endocrine system we find further integration and pleasure in the ease of transitions and moving through space. In this first module we explore the pre-vertebral patterns – the developmental stages of our ontogenetic evolution from conception to readiness for birth, mirroring the phylogenetic life of different animal species – from the single celled animal through sponges, starfish, sea squirts to the pre-spinal amphioxus. · Learning how to support re-patterning and integration of these neurological pathways through skilful observation and hands-on practice. In this second module we explore the vertebral patterns – the developmental stages of our ontogenetic evolution from the readiness for birth, to standing and walking, mirroring the phylogenetic life of different animal species – from the spinal fish, through amphibian and reptilian to contralateral mammals. Embodying and integrating the RRR’s supports all integrated, effortless movement. They create the alphabet for the development of our movement vocabulary. RRR’s occur as a response to relationship – with oneself, the earth, space and/or others. We will embody the reflexes, righting reactions and equilibrium responses that underlie, support and integrate our capacity to gather into ourselves, reach out into the environment, take hold of what we need, balance our weight and move through space - from rolling through to verticality and locomotion. Through somatic practice we access ways to transform habitual psychophysical habits to realize the potential and possibilities present in the relational field. This requires a practice of conscious presence that engages with self, other and community. Bringing these qualities to our lives enables us to deepen our connection with the living world, cultivating and sustaining our aliveness. 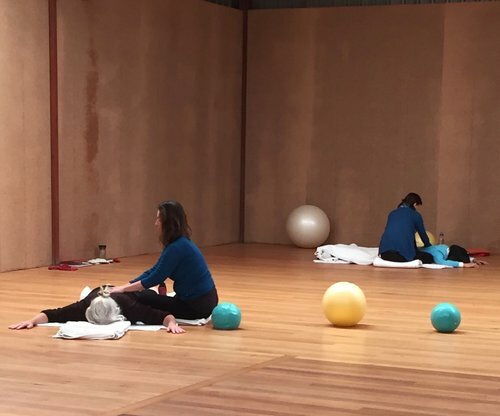 Guided somatizations will encourage and enable embodiment of the different systems and neurocellular patterns that lay the ground for deeper emotional, psychological and physical integration. As we attend to moving as research we attune our whole self to being present in each moment with as much awareness as possible. This provides insight and the potential to support clients in their integration and transformation of experience. Students are required to submit a 500-word essay at the end of each module with their reflections and self-assessment. A feedback form will provide an opportunity to comment on all aspects of the course, accommodation and teaching in order to adapt or improve the program. Continuous evaluation and conversation is invited during the course or when requested. Students are required to do a minimum of 10 hours private sessions with the professional practitioner of their choice. They are encouraged to try different somatic modalities i.e. Alexander Technique, Shiatsu, Cranio-sacral Therapy and Feldenkrais, as well as BMC. Students are sent a booklist and are required to purchase these beforehand. On arrival they are given comprehensive notes related to the module and a journal. Included in the notes are an introduction to ISMETA’s Code of Ethics and Standards of Practice and a feedback form. 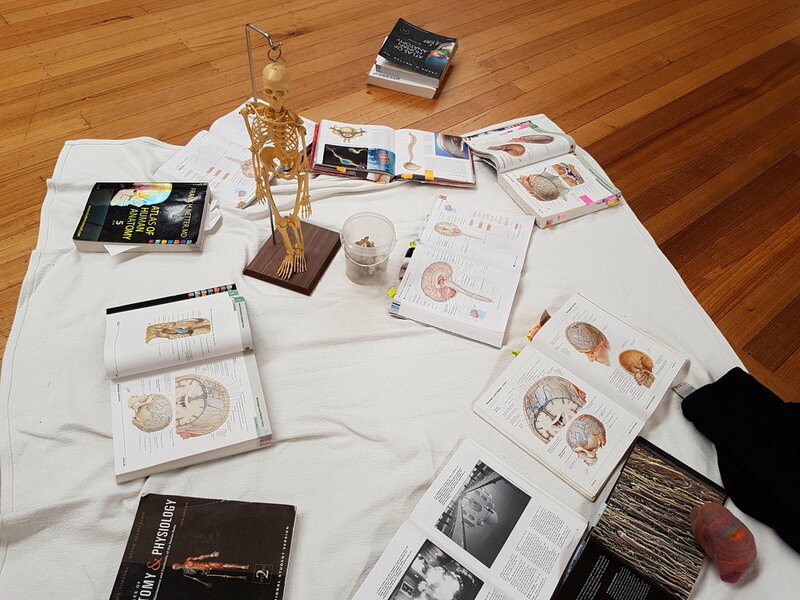 A library of anatomy and reference books is available for student use.